You prefer fast-forward Poker or tournaments? Then unfortunately, the bwin Poker Cash Game Challenge isn’t the right thing for you, because the promotion aims at those of you who are seeking luck at classic cash game tables. At the Cash Game Challenge, you have the chance to get a bonus of up to $40 every week. You’re wondering how the bwin Poker Cash Game Challenge works and how to participate? It’s basically very easy. All you have to do is register for the Cash Game Challenge, have a seat at one of your preferred cash game tables (including casual cash game) and play. 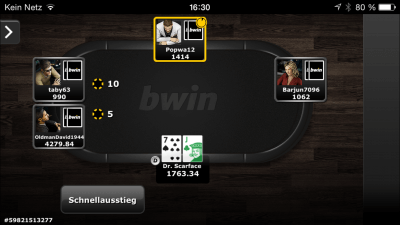 While playing you automatically collect bwin points. If you reach a certain score on at least four days of the week you receive a bonus from bwin. The following overview shows you how many points correlate with which bonus. You’re not registered at bwin yet? Then you can signup here for free. Next to the “normal” Cash Game Challenge bwin also offers a special variant for high rollers and frequent players, the Cash Game Challenge Ultimate. The procedure is the same. You register for the Cash Game Challenge Ultimate through your account and then play at the cash game tables of your choice. If you reach the maximum point mark on seven days of the week you receive a $400 poker bonus. 2. The Cash Games Challenge Ultimate starts weekly on Mondays at 00:00 (CET) and ends each following Sunday at 23:59 (CET) (the “Qualifying Week”). 5. The poker bonus will be issued into the player’s account the Monday after the qualifying week in which the poker bonus was earned. Try to reach the point mark of your choice on as many days as you can in the time between Monday and Sunday. The poker bonus will then be credited to your account on the following Monday. 6. Each poker bonus is subject to individual wagering restrictions and has to be cleared according to the bonus rules that can be found in the poker client in the “My account” section under the “Bonus” tab. 7. For each $1 bonus given through the Cash Games Challenge Ultimate, the player must earn 10 points and the entire bonus will be released in increments. The poker bonus underlies wagering conditions. For each dollar bonus, you have to collect 10 points. Only if you do that the bonus money is unlocked and you can withdraw it from your account. 8. Players must opt in each week but points will count retroactively starting Mondays for this week after the player has opted in. The bwin Cash Game Challenge starts over every week. That means that you have to register again every week. 10. The player can take part in the Cash Games Challenge Ultimate and the Cash Games Challenge simultaneously. Convenient: You can take part in both Cash Game Challenges at the same time. 11. The poker bonus can only be redeemed at Cash Game tables. Again, this refers to points 6 and 7: The bonus dollars can only be unlocked at the cash game tables.